We’d love your help. Let us know what’s wrong with this preview of Death Comes to Pemberley by P.D. James. It is 1803, six years since Elizabeth and Darcy embarked on their life together at Pemberley, Darcy’s magnificent estate. Their peaceful, orderly world see A rare meeting of literary genius: P. D. James, long among the most admired mystery writers of our time, draws the characters of Jane Austen’s beloved novel Pride and Prejudice into a tale of murder and emotional mayhem. To ask other readers questions about Death Comes to Pemberley, please sign up. Is the murderer one of the original characters of Pride and Prejudice? This answer contains spoilers… (view spoiler)[ It is believed so for the majority of the book. I had to comment because Michelle's answer is wrong. She said, "The actual killer is an original…more It is believed so for the majority of the book. A hideous, plodding, ungraceful piece of mawkish fanfiction that succeeds neither as a mystery or as a pastiche of Austen's most beloved novel. Oy. Almost from page one, there are embarassing lapses of craft and tone. None of the economy or vibrance of Austen appears in these pages and the so-called plot is built around a "mystery" that was so hamhanded that I'd sussed the perpetrator within the first 50 pages. But that's not the worst of it. Some of the greatest characters in world literature re A hideous, plodding, ungraceful piece of mawkish fanfiction that succeeds neither as a mystery or as a pastiche of Austen's most beloved novel. Oy. Almost from page one, there are embarassing lapses of craft and tone. None of the economy or vibrance of Austen appears in these pages and the so-called plot is built around a "mystery" that was so hamhanded that I'd sussed the perpetrator within the first 50 pages. But that's not the worst of it. Some of the greatest characters in world literature reduced to the thinness of playing cards. Fancy-dress dialogue that humps along without import or impact. More than anything, this entire story has an air of workmanlike drudgery about it, as if a third of the way in James had realized she wasn't up to the task but soldiered through by force of duty. Apathy and sloppiness strangle this book a page at a time. Any fiction that "expands" on an existing narrative must do heavy lifting (familiarizing fresh readers with the previous work, but also standing on its own merit). This book accomplishes neither. I cannot imagine WHAT possessed anyone to publish this outside of James successful track record as a crime novelist. If anything, that skill set should have been a deterrent. For some reasons of her own, James structures the entire experiment as a closed "country house" mystery with (essentially) a single location. As in the most inept mystery fiction, she treats the P&P characters as unchanging chess pieces sealed in aspic with a single defining character trait. No one here has a believable emotion or motivation. Unlike Austen, James presents a plot which is a flimsy, mechanical contrivance existing purely to generate tiffs and tizzies with no real weight or consequence to anyone. None of the pacing or movement or drama of an Austen novel is in evidence. And watching endless cooing and billing by the Darcys and the Bingleys had me reaching for the airsick bag often. THERE ARE NO STAKES. What lobotomized Jane Austen was P.D. James reading when this thing got cranked out? Where was the wit, bite, and wiliness of Austen's world? I respect James as a mystery author, but this was appalling in most of its particulars: plot, diction, character, setting. For me the hardest thing to read were the incessant "remember when?" exposition nuggets by characters recounting many, many MAJOR events from Pride & Prejudice as if they were all recovering amnesiacs giving depositions in an imaginary courtroom. "Remember when she said to me... Remember when I asked you..." I can only assume the James felt like we might need a refresher course, so she has characters turn to each other and explain proposals, embarassments, arguments, scandal from P&P... as if everyone on the page has had a closed head injury in the intervening years. As if people reading THIS book wouldn't be familiar with the other greater novel's most critical scenes and lines. As if quoting Austen was the same thing as expanding upon her. As if Austen's characters are so wooden and static that they cannot manage to do anything that they have not already done 200 years ago for thir creator. As if "historicizing" Austen's characters didn't encumber some of English literature's most nimble creations with deadening, leaden weight. And apparently James has no interest in the beloved characters AS characters as they neither act or speak like themselves (even when quoting their earlier dialogue), nor does she allow them to be changed by the (pointless/flaccid) events of this novel. The convoluted, digressive explanations for offpage actions in P&P derail this book repeatedly. James is so busy opining about events long past and unrelated that for long stretches she forgets that she's supposed to be, y'know, writing a book of her own. A simpering Elizabeth who now distrusts/dismisses Charlotte (Lucas) Collins on a whim and worried more about sick servants and social obligations than Wickham's invasion of her home? A Mr. Bennett who now sneaks off to hide from his wife's "flutterings and spasms" in the Pemberley library? A Darcy who traces his austerity to Oprah-ific childhood traumas and protects Wickham with little difficulty? Gack. Ick. This is in effect, a piece of inept P&P rhapsody which treats the main characters of its source material as the very boring, bourgeois blockheads they skewered so ruthlessly in Austen's novel. Which begs the question: if James cannot write the characters, if she had no sense of the subtlety or a feel for emotional plotting, why bother to write this book? Again, shades of the feeblest fanfiction by the most uncritical amateur... Death by blundering timidity. Ugh. What can you expect if you DO read this hash? No characterization to speak of. Swampy stretches of pointless research ladeled in as if to fill wordcount requirements. A slim, idiotic "mystery" that telegraphs its solution from around page 45. Lots of suspiciously procedural mystery writing in "ye olde" Regency-speak. Dangling plot threads and unshocking "surprises" by the barrel. Long, long passages of obligatory backstory delivered in massive unparagraphed chunks as if, by parroting some of Austen's diction, James might swipe some of the spark and effervescence. Not hardly. Ugh. Endless, ridiculous requotings of "good bits" from Austen's writing lifted DIRECTLY from the six major novels that jarred every time I stumbled over them. Apparently, James just liked certain phrases so darned much she decided to plunk them in wholesale and the effect is uncomfortably awkward. These regurgitations resonate not as loving homage but as failure of imagination and craft. To take one example, Elizabeth can apparently ONLY be described as having "fine eyes." Wickham must always be tagged with the phrase "quite wild." And Pemberly is "polluted" THREE times in this book, and Lady Catherine doesn't even show up to use her own words. And a good thing, if the clunky, leaden Darcy and Elizabeth here are any indication, any of Austen's creations who don't turn up for the "scandalous" proceedings got off lightly. And don't get me started on the weird easter eggs giving "clever" shout-outs to other Austen characters (Harriet Smith, Anne Elliot). Again, in what universe does any of this posturing resemble Austen or even a competent piece of fiction? James knows better. Her publishers know better. Her readers should know better. Are people so bamboozled by the spectre of "great literature" and an éminence grise that they'll swallow this kind of muck uncritically? This entire book felt feeble and awkward and a little embarassing. If you are an Austen fan you'll loathe it; if you are a mystery fan you'll find it juvenile and obvious; if you're an educated reader you'll feel insulted and bored. Neither fish nor fowl, the book exists as a kind of a trout with wings (or sparrow with gills) expiring painfully and repetitively for 280 unwitty pages. About halfway through I realized that this is EXACTLY the kind of Austen pastiche enjoyed by people who don't actually read Austen, and who believe that all period fiction just needs some velvet and horses and servants to thrill us to our middlebrow Masterpiece Theatre marrows. When I'd finished, I tried to imagine the intended audience... Best I could come up with: elderly suburban nonreaders who love telly but can't follow any story without coaching from well-meaning relatives and a repeated peeks at the TV Guide blurb. Oh dear. What were PD James, her agent and her publisher thinking? And more to the point, what was I thinking, deciding to actually spend money on this book? All I can say is that it seemed like a good idea at the time. I am in what I presume to be the target demographic for this novel: female, passionate about Jane Austen's novels, a long-time reader of crime fiction and a fan of PD James to boot. Indeed, if James' name had not been on the cover, this is a book I would not have contemplated rea Oh dear. What were PD James, her agent and her publisher thinking? And more to the point, what was I thinking, deciding to actually spend money on this book? All I can say is that it seemed like a good idea at the time. I am in what I presume to be the target demographic for this novel: female, passionate about Jane Austen's novels, a long-time reader of crime fiction and a fan of PD James to boot. Indeed, if James' name had not been on the cover, this is a book I would not have contemplated reading, for while I love Austen, I have an instinctive prejudice against the Austen prequel-sequel-continuation-fanfic industry. PD James, I thought, could make this work. She didn't. So what seemed like a good idea turned into a very bad idea indeed. Where to start? I'll try to come up with something positive to say about the book first. Well .... from time to time, when some of the book's more egregious flaws weren't overwhelming me, the fact that James can write clear and elegant prose actually came through. There are bits of witty dialogue and the occasional worthwhile section of descriptive language. Hmmm.... that's about it for the positives. As for the negatives, the problem will be to limit myself to just a few of the things I disliked most. I'll start with the disastrous lack of characterisation and the tedious plot. The re-booted Austen characters - Darcy, Elizabeth, Jane, Bingley, Wickham and so on - are flat and diminished. All of the life Austen breathed into them has been sucked out. James' own characters are scarcely more interesting. The plot is dull and for a mystery it's not very mysterious. Sure, there's a dead body, but there's remarkably little detecting and the resolution - which arises from a deus ex machina (view spoiler)[deathbed confession (hide spoiler)] falls as flat as the characterisation. What else? Well, there are some extremely annoying "As you know, Bob" information dumps which made my eyes roll clear to the back of my head. Equally annoying (although I admit it made both me and my husband hoot with laughter) was a section in which Darcy foreshadows changes to the jury system in criminal trials and the introduction of appeals from jury verdicts. I seem to recall another bit of foreshadowing: something about how America was going to become a great nation in which human rights would be protected. (I'm hazy on the details here. That bit came at a point when I was pretty desperate to finish the book). Another thing I hated was the introduction of characters from other Austen novels whose names are randomly woven into the narrative, for what purpose I have no idea. It was unnecessary, clumsy and frankly laughable. I could write a lot more about the problems I have with the novel, but I'll leave that to others. If I keep going I might not know when to stop. I know from my long experience of reading James' novels that she is a writer of competent police procedurals. But something went very wrong with this experiment. Readers who want to read a Pride and Prejudice continuation will want to at least recognise the characters they know and love. They won't find them in this novel. Readers who want to read a mystery novel will want a puzzle to solve. Their expectations won't be met either. Admittedly, when I started reading this novel I wasn't convinced that it would appeal to me. That was my prejudice against Austen fanfic speaking. I thought James could be the writer who would lead me to overcome that prejudice - or that at the very least I would get to read an entertaining piece of crime fiction - but that was not to be. This book is a big fail in all departments, only made bearable by the fact that it was a buddy read with my friends Jemidar and Jeannette. The lesson I have learned from the experience? My aversion to Austen fan fiction is soundly based. If I want to read about Elizabeth and Darcy, I'll re-read Pride and Prejudice. Austen's characters belong in her novels and in my imagination. I really don't want to see them anywhere else. I thought about giving this book two stars, but I can't. Maybe it deserves 1-1/2 stars for good grammar, well-constructed sentences and no obvious typos. I can't rate it any more highly than that. I considered mounting a passionate defense in favor of this lovingly-rendered tribute to Jane Austen, but then I decided I couldn't care less what the naysayers think. If you pick up this gentle whodunit expecting the sartorial sleuthing of Commander Adam Dalgliesh, you will be disappointed. If you read this looking for the ghost of Jane Austen, you will catch but a glimpse of her delicate frame. Although the point of fan-fiction escapes me entirely (I can't help but think of tribute bands; I ha I considered mounting a passionate defense in favor of this lovingly-rendered tribute to Jane Austen, but then I decided I couldn't care less what the naysayers think. If you pick up this gentle whodunit expecting the sartorial sleuthing of Commander Adam Dalgliesh, you will be disappointed. If you read this looking for the ghost of Jane Austen, you will catch but a glimpse of her delicate frame. Although the point of fan-fiction escapes me entirely (I can't help but think of tribute bands; I have no more desire to explore fan-fiction than I would to see my approaching-middle-age cohorts belt out Whitesnake's greatest hits), Death Comes to Pemberley reads like a tender squeeze of affection from one national literary treasure to another. If you do sink into this literary treat, know that your Jane ear will delight in the recaptured cadence of her prose and that you will be enchanted by the sense and sensibilities of Regency Britain. You will encounter familiar names and faces from across the Austen oeuvre; you will be moved by James's piquant touches of the political and social realities of the era. If you aren't able to let go and enjoy Death Comes to Pemberley within its opening pages, put it down, walk away and spend your time reading something better suited to your expectations. 1.5 stars, grudgingly rounded up. Well-known detective fiction writer P.D. James took on the Pride and Prejudice characters and setting in this murder mystery. It's 6 years after the end of P&P, and Darcy and Elizabeth are preparing to host their annual autumn ball. Wickham and Lydia--who are NOT invited--are nevertheless traveling to Pemberley. Because that's just the sort of thing they do. But something strange happens to them in the woods near Pemberley. Lydia arrives at the Darcy home in 1.5 stars, grudgingly rounded up. Well-known detective fiction writer P.D. James took on the Pride and Prejudice characters and setting in this murder mystery. It's 6 years after the end of P&P, and Darcy and Elizabeth are preparing to host their annual autumn ball. Wickham and Lydia--who are NOT invited--are nevertheless traveling to Pemberley. Because that's just the sort of thing they do. But something strange happens to them in the woods near Pemberley. Lydia arrives at the Darcy home in hysterics, wailing that her husband Wickham has been shot by a man named Denny, Wickham's friend. When the hastily organized search party finds Wickham, it's the opposite: Wickham is drunkenly weeping by Denny's body, saying that he had killed his friend. Is that actually a confession of murder? In any case, it's highly incriminating, and Wickham is taken into custody. And here we launch into the details of the murder investigation and the 19th century British legal system, and how criminal cases were handled. I'm an Austen fan AND a lawyer, and I found it as dry as a bone. The characters have very little relation to Austen's, and the wit and humor is as dead as poor Denny. How an accomplished author takes several interesting ingredients--a murder mystery and the Pride and Prejudice setting and characters--and manages to stir them together and bake them into a stiff, boring, humorless lump of underdone pumpernickel bread, is a mystery that, sadly, will remain forever unanswered. I kept thinking of the title of an old Ogden Nash poem: "Will You Have Your Tedium Rare or Medium?" It started off intriguingly enough when Lydia (fifth and most reprobate Bennett daughter from "Pride and Prejudice") runs into Pemberley, where her elder sister now resides, screaming that her husband has been murdered. Not your average Jane Austen fare, but enough to make a modern reader sit up and take notice. This is followed by maybe a hundred pages where I was still enjoying the experience of a "new Pride and Prejudice" as P.D. James seemed to have captured the essence of the characters, and also up to a point, Jane Austen's style of writing. But something was missing. Then it hit me. There was no humour, no wit, and it was all getting rather boring. It descended into a monotonous police procedural with a very messy attempt to incur some mystery towards the end. This is perhaps the worst of all the Pride and Prejudice sequels and prequels. Over the years I've read some outlandish stuff-Elizabeth and Darcy enjoying a quickie in the morning room, an insane woman haunting Pemberley and making Darcy unfit for Miss Eliza-and other such rubbish. But nowhere else did they seem so dull and lifeless, so devoid of charm and spark. Be forewarned, the death referred to in the title is really that of Elizabeth Bennett which is simply unforgivable. Where I got the book: my local library. Unable to finish for the reasons cited below: made it to page 80. It hurts to write this review. I LOVE PD James. Her subtlety, her edginess, the sheer intelligence of her prose, the nuances of her characters...I could go on. And NONE of this is to be found within the pages of Death Comes to Pemberley. I'm sure I wasn't the only fan to get all excited about the idea of PD James doing Pride and Prejudice; what insights, what delicate twists of humor, what li Where I got the book: my local library. Unable to finish for the reasons cited below: made it to page 80. It hurts to write this review. I LOVE PD James. Her subtlety, her edginess, the sheer intelligence of her prose, the nuances of her characters...I could go on. And NONE of this is to be found within the pages of Death Comes to Pemberley. I'm sure I wasn't the only fan to get all excited about the idea of PD James doing Pride and Prejudice; what insights, what delicate twists of humor, what light would she shed on Jane Austen's world? So I feel cheated. I feel like the crime that's been committed here is not within the pages, but is against the reader who expected a PD James novel and got--yes, I've got to say it--SOPHOMORIC DRIVEL. Chunks of turgid prose. Inane dialogue that appears to have come straight from the pages of a 1950s girls' magazine. A cringeworthy prologue that pretty much recounts the plot of P&P in what-I-read-over-the-summer-holidays essay style. Stiff, stilted, wooden characters from a Pride & Prejudice puppet show. And published by Alfred A. Knopf, a publishing house that's even older than James (OH DAMN I WASN'T GOING TO MENTION HER AGE BUT. 92.) Now owned (Knopf, not James, although that's also debatable) by Random House. Who also recently gave us Fifty Shades of Grey. I have listened to the traditional publishing world SCREAMING that they are the last bastion of quality in publishing and that all the newcomers on the scene don't give a crap about good literature. And then they do this. I'm not going to start questioning why James is writing fan fiction in the style of a 20-year-old novice. I really don't care. But I care a whole lot that agents, editors, publishing committees and executives were more interested in the fact that 98% of James fans would read this book and that it was bound to sell well than in whether or not IT DESERVED TO SEE THE LIGHT OF DAY. There were good and bad things about this book. It gave more nuanced portraits of some of the characters, notably Darcy but also some minor characters. It invites the reader to think a little differently about Jane Austen's classic novel. However, the use of Austen's source material, though meant as an affectionate tribute, is wooden, often heavy-handed and often overdone. Some characters are dealt with unsatisfactorily. Mary ends up in a situation which for her is suitable (in fact I had though There were good and bad things about this book. It gave more nuanced portraits of some of the characters, notably Darcy but also some minor characters. It invites the reader to think a little differently about Jane Austen's classic novel. However, the use of Austen's source material, though meant as an affectionate tribute, is wooden, often heavy-handed and often overdone. Some characters are dealt with unsatisfactorily. Mary ends up in a situation which for her is suitable (in fact I had thought of a similar fate for her long before reading this). But Kitty is scarcely mentioned, is portrayed in a way that doesn't jive with Austen's version of her, and is relegated to the shadows. Mrs. Bennet, who could have provided some gorgeous comic relief, is barely heard from. Lady Catherine, suitably housebroken, barely barks at all. Finally, Georgiana's fate, while happy, seems engineered in a rather facile way and perplexes me also. Recommends it for: people who neither understand the past nor care about Pride and Prejudice or mysteries. Some years after Pride and Prejudice, Lydia Wickham (nee Bennet) stumbles through the front door of Pemberley in hysterics. There were gunshots in the woods, and she's sure her husband has been murdered. Darcy and some of the other men go out in search, and find (view spoiler)[Mr. Wickham crouched over Denny's body. He is covered in blood and, upon seeing them, says he killed his friend. (hide spoiler)] Darcy summons the magistrate and then spends the entire rest of the novel thinking anachronis Some years after Pride and Prejudice, Lydia Wickham (nee Bennet) stumbles through the front door of Pemberley in hysterics. There were gunshots in the woods, and she's sure her husband has been murdered. Darcy and some of the other men go out in search, and find (view spoiler)[Mr. Wickham crouched over Denny's body. He is covered in blood and, upon seeing them, says he killed his friend. (hide spoiler)] Darcy summons the magistrate and then spends the entire rest of the novel thinking anachronistic thoughts and doing absolutely nothing related to the murder investigation. In fact, there really isn't a murder investigation; the most the characters do in regards to the murder is sit around the fire talking about whether or not the alleged murderer has the mindset possible to do the deed. No evidence turns up, nor do the characters make any attempt to find any. The full story of the murder is randomly turned up in a deathbed confession, and then another character equally randomly confesses the rest of the plot. It's a very odd book. Usually a murder mystery involves a long period of finding out clues, or talking to witnesses, or figuring out the motives--and instead the characters just go over the same three facts ad nauseum. For example: we see the discovery of the body through Mr. Darcy's eyes, and then he relives the discovery a few times, and then he recounts the discovery several times to various law enforcement personnel. His story and view of the facts never change, so there's no point to going over it all again almost word-for-word. It's no good as historical fiction, because although James has clearly done some research into the period (which she infodumps randomly; for example, apropos of nothing, Darcy soapboxes about the need for an appeals court) she doesn't seem to get the underpinnings of Regency society. The characters are worried that they might upset the police by moving the body--even though they would have no reason to expect an autopsy, and the police of the time were a distrustred force of ill-trained, ill-paid, low class dudes who barely existed yet. And even a century later the police wouldn't be going in the front door, let alone questioning rich gentlemen about their alibis in the parlor! And it doesn't work as a continuation of Pride and Prejudice, either. The spirit and wit of Austen is completely missing, but then I expected that. But the characters are all wrong as well! Elizabeth is a quiet, maternal figure in the background, who has about three scenes total. She and Mr.Darcy hardly speak to each other, except to utter platitudes about how happy they are to have children or to rehash old lines from P&P. Colonel Fitzwilliam gets a complete character assassination--far from the wry, practical man who bantered with Lizzy, here he's a prig who despises her. It doesn't ring true. Death Comes to Pemberley just doesn't satisfy on any level. If you're looking for murder mysteries set in the Regency period, I suggest the Julian Kestral series by Kate Ross instead. Heard about this book on NPR today. Sounds like a great read--Jane Austen and a murder mystery all wrapped up in one! Ok, now it's several months later and I've had the opportunity to read the book. It was tolerable, I suppose, for a read at the beach. But I admit it failed to live up to the expectations of an Austen novel or a good murder mystery. As for striving to achieve the heights of Austen, I feel James spent too much time apologizing for the actions of the characters in P&P. I think w Heard about this book on NPR today. Sounds like a great read--Jane Austen and a murder mystery all wrapped up in one! 1.) Protracted portions of the novel are spent summarizing what happened in P&P. I seriously can't imagine that any but a tiny fraction of the realistic audience for this book isn't familiar enough with the story for this to be unnecessary. Plus it is REALLY ANNOYING to the large fraction who are. 2.) The author makes a few changes to Austen canon which in itself is not a problem if done well and for a reasonable purpose. BUT. Two of these changes (what "ends up happening" to Mary and Kitty) are merely inexplicable, because Mary and Kitty do not figure in the plot at all, so really, why bother? And the other is basically unforgivable. In P&P Darcy's mother dies when Georgiana is very young and then his father dies several years later. This order of events is significant in shaping the characters of Darcy, Wickham and Georgiana who then commit the acts which drive the plot. If the parental death order were reversed, as James has it, their characters may have developed very differently and so would everything else! WTF. Can you really imagine Lady Anne continuing to spoil her husband's pet George Wickham even after his death? James never deals with the implications of this at all. 3.) How in the hell can you have a P&P sequel in which Elizabeth and Darcy barely have a single conversation? I mean, really! Isn't that the entire point of P&P sequels? 4.) (a) If I wanted a primer on the intricacies of Regency-era law this is not the first medium I would turn to. Yet that is what readers of this will get. However (b) the device of explaining and analyzing all of that history here, while it could be interesting, (c) is not and (d) makes no sense because the person who is purportedly ignorant about so much of the procedure, Darcy, is a magistrate and supposedly a very intelligent, well-read, well-informed person so why would he constantly need everything explained to him? WHY? 5.) Just from a general writing perspective: way too much telling, not at all enough showing. 6.) The mystery ends up being totally disappointing. Half of it is telegraphed from the beginning and the other half is relatively un-deducible. Also, the only thing driving me to finish this was my hope that one of the central P&P characters besides the obvious had committed some sort of unexpected dastardly deed. BUT NO. 7.) The best comic characters (Mrs. Bennet, Lady Catherine, Mr. Collins) make appearances only by letter. This book is the literary equivalent of a sleeping pill. It is a P&P spin-off murder mystery and while it is obvious that the author took pains to research how a murder investigation was conducted in the Regency Era, it is even more -and for me painfully and annoyingly- obvious(YES, I DO TAKE THINGS AUSTEN VERY PERSONAL!) that she did not bother when it came to the representation of Jane Austen's P&P characters. She just had NO CLUE which is rather unpardonable when you are a writer of mys This book is the literary equivalent of a sleeping pill. When it comes to re-writings or new versions of classical novels and classical characters, I am the least open-minded person imaginable, especially when we are talking about Pride and Prejudice. However, I really enjoyed P.D.James' treatment of Elizabeth, Darcy and Georgiana, because it is clear that she respected Jane Austen's creations and tried to breathe new life unto them, presenting their lives after their marriage. I liked the descriptions of the trials that took place, having the chance When it comes to re-writings or new versions of classical novels and classical characters, I am the least open-minded person imaginable, especially when we are talking about Pride and Prejudice. However, I really enjoyed P.D.James' treatment of Elizabeth, Darcy and Georgiana, because it is clear that she respected Jane Austen's creations and tried to breathe new life unto them, presenting their lives after their marriage. I liked the descriptions of the trials that took place, having the chance to see how justice was conducted at the time, something that I haven't come across in any other book I have read in such detail. When I won an advance copy of this book on Goodreads I was thrilled. Perhaps I approached the story with expectations too high. I wanted so much to like it, but the more I read the more disappointed I became. The prose is very well-written and somewhat in the Austen manner, but without the subtle wit. What I found tiresome was the story-telling. The first word of dialogue is not spoken for many, many pages and much of the dialogue is actually a series of lengthy monologues that sound more like n When I won an advance copy of this book on Goodreads I was thrilled. Perhaps I approached the story with expectations too high. I wanted so much to like it, but the more I read the more disappointed I became. The prose is very well-written and somewhat in the Austen manner, but without the subtle wit. What I found tiresome was the story-telling. The first word of dialogue is not spoken for many, many pages and much of the dialogue is actually a series of lengthy monologues that sound more like narrative. Passages of action are often repeated almost word for word when one character tells another what happened or testimony is recounted at the inquest and trial. There seemed to be so little at stake and no one except the police made any effort to sort out the mystery. In the end it only comes to light when the perpetrator confesses. The last fifty pages are characters explanations of how the murder came about and why they went to such lengths to cover it up. I struggled through to the end hoping it would get better, but it never did. I hate to write a bad review, but with the publisher charging $25 Cdn for this book, I wanted to warn potential buyers. I'm really torn about this book. One of my favorite mystery writers meets one of my favorite stories; it's gotta be good, right? And it is good. But it's not great, and I was hoping for great. I shy away from a lot of the Pride and Prejudice follow ons--fan fiction legitimized by a publisher, and sometimes not nearly as good as amateur fan fiction. But this I was eager to read. And I will say, it held my interest. James does a good job of capturing the spirit and even language of Austen, not per I'm really torn about this book. One of my favorite mystery writers meets one of my favorite stories; it's gotta be good, right? And it is good. But it's not great, and I was hoping for great. I shy away from a lot of the Pride and Prejudice follow ons--fan fiction legitimized by a publisher, and sometimes not nearly as good as amateur fan fiction. But this I was eager to read. And I will say, it held my interest. James does a good job of capturing the spirit and even language of Austen, not perfectly, but definitely nothing to cringe at. But there were missteps, in my opinion. First, too much time and ink was spent essentially retelling the story of Pride and Prejudice and not enough time building on it. There were long passages throughout the book that just recapped the original story. Granted, not every one of James' readers will have read P&P, but I'd venture most of us will have. That's why we picked this up to begin with. Trust your readers a bit. And if they haven't read it, give them an excuse to, instead of just giving them a recap so they don't have to. Unfortunately, retelling the original was not the only time James strayed from the "show, don't tell" rule. There was also a lot of exposition done through long monologues by different characters. Indeed, the mystery itself was weak and not very satisfying--which pains me to say because this is P. D. James after all. Finally, and perhaps most disappointing of all, there simply wasn't enough interaction between Elizabeth and Darcy. They seemed to be each pursuing different activities through most of the book. Let's face it, part of the joy of returning to them post P&P is getting back to the delicious sexual tension that Austen crafted. I wanted them to be less intellect and more passion. But here again it was told, not shown. It is a truth universally acknowledged that a good writer attempting to emulate a great writer will invariably fail. Even if that good writer is considered to be the doyenne of her genre, readers seeking the focused wit and social observation of the original creator will close her book frustrated, especially if many reviewers extoll the sequel's virtues as entertainment and fitting homage. A few brief passages sparkle with the reflected brilliance of Austen and most of them have been extensively It is a truth universally acknowledged that a good writer attempting to emulate a great writer will invariably fail. Even if that good writer is considered to be the doyenne of her genre, readers seeking the focused wit and social observation of the original creator will close her book frustrated, especially if many reviewers extoll the sequel's virtues as entertainment and fitting homage. A few brief passages sparkle with the reflected brilliance of Austen and most of them have been extensively quoted in reviews. If you are looking for the good lines, read those and forget the book. If however, you wish to be entertained for several hours, James, crafts an enjoyable if predictable mystery. Her style is far more descriptive of the environment of Pemberley and unlike Austen, she neglects to reveal character through dialogue and interaction, but relies solely on reflection. Most disappointingly, perhaps because of her own preferences for central male characters, James exerts virtually all of her energy on expanding on Mr. Darcy's character instead of allowing Elizabeth to remain front and center. Her motherly Elizabeth bears no resemblance to the intelligent and appealingly flawed center of Pride and Prejudice. It's as if James believes that marriage and motherhood are truly the end of the line for women and the assumption of these roles consign them forever banal characterizations as Madonnas (Elizabeth, Jane) or Medusas (Lady Catherine, Mrs. Bennet, Lydia). her views quite plain; 'Let other pens dwell on the guilt and misery. subjects, she would have written this story herself, and done better. I love love love this.Makes me want to read it even more. This book seems to be about as divisive as abortion with some reviewers seeing it as a crime against humanity and others defending a woman's right to choose - in this case, a 90 year old's right to choose to have a blast with one of her favourite writers. Two stars might seem to put me firmly in the pro-life camp, but two stars is OK. It was OK. I expected a refreshing swill round the mouth, a palate-cleanser for between the heavy tomes. What I got was leaden in places; the glaringly obvious devi This book seems to be about as divisive as abortion with some reviewers seeing it as a crime against humanity and others defending a woman's right to choose - in this case, a 90 year old's right to choose to have a blast with one of her favourite writers. I hate to mark it 'read' as I did not finish it. I found it painful to read--so many errors in period, errors in tone, errors in characterization, humorless and altogether so disappointing I wish I had not spent money on it. This book was absolutely delightful. Perhaps not to an Austen purist, of course. But as a PD James fan and an Austen fan, this was a fantastic read. I have never had any interest in the Jane Austen spin-off industry. Never understood why all those writers couldn’t come up with their own damn characters and leave Austen’s beloved creations alone. But when PD James jumped on the bandwagon, I thought, well, okay, there’s a proven good writer and I buckled. Too bad. Now I know that PD James possesses neither wit nor humor. Not that I ever would have condemned her for lacking such traits. I always held her in high esteem--Devices and Desires is o I have never had any interest in the Jane Austen spin-off industry. Never understood why all those writers couldn’t come up with their own damn characters and leave Austen’s beloved creations alone. But when PD James jumped on the bandwagon, I thought, well, okay, there’s a proven good writer and I buckled. Too bad. Now I know that PD James possesses neither wit nor humor. Not that I ever would have condemned her for lacking such traits. I always held her in high esteem--Devices and Desires is one of my all time favorite reading experiences. But, once borrowed, Jane Austen’s characters deserve to be handled with the same wit and humor they were accustomed to, and here PD James miserably fails them all. At first, I enjoyed the reintroduction of Darcy, Elizabeth, Colonel Fitzwilliam. Just the names alone took me back to my first reading of Pride and Prejudice (and better yet the superior BBC miniseries way back in the 80s). Then, the genius idea of killing off Wickham—so deserving of a mysterious death. The list of suspects with grievances is enough to weave an excellent whodunit. Okay, what fun! Let’s keep reading….huh, what? Who is dead? Wait, who was he again? I’m supposed to care about him? Isn’t this section of driving into the forest looking for the body and who is sitting in what room or looking out what window while waiting for the search party to return and then getting the body back and putting the body on the table and laying the pillows and blankets on the sofa and deciding who will sleep where and what servants are doing going on a little too long? Yes it is. Turns out that’s about 85 percent of the entire content of the novel. Maybe a better title should have been Lots of Housekeeping Issues Arise When Death Comes to Pemberley. For the majority of this novel, we are expected to read and reread and read again the same account of that one evening, which was aptly explained the first time, and was not so many pages back that I really need to keep re-reading it. I am perfectly capable of following along and there is very little chance that I am going to forget the only tiny bit of action that happened in this book to begin with. I am on page 216 and I just read, again, the fact that there was an argument in the carriage, someone leaves the carriage, they were going on to the King’s Arms at Lambton, Wickham was not received at Pemberely ever. Repetitive, repetitive, repetitive. Does PD James and her editor vacation and spend the holidays together? Because there were serious problems with the writing and pace here that were ignored and that might be the biggest mystery about this book. I would really like to know what goes on in those publishing houses when dreck like this shows up but the author is a sacred cow. Truly flawed as a mystery. Bad storytelling, badly paced. No misdirection, layers of suspects and or motives. Not until the end of the book do we get an info-dump that explains why we read the first two hundred plus pages of repetitive text and the ending is just (view spoiler)[ wrong place wrong time? (hide spoiler)] Sorry about that old bloke! I won’t even touch on the really really lame heart to heart talk between Darcy and Elizabeth at the end. Just horrible and sad. A creative spin on historical crime fiction, this isn't my favourite of PD James' works but it still has an impressive style all its own. I consider it more than a bit perplexing when an author begins their book with an apology. In this case, it is to author Jane Austen for using her characters. Since Death Comes to Pemberley is a sequel to Austen’s Pride and Prejudice, it is like apologizing for snow being cold. If you are going to write a sequel to a classic of world literature, it is, what it is. Don’t apologize for it. It really puts me off my reading game from the get go. Okay, I got that off my chest, so now on to more pleasa I consider it more than a bit perplexing when an author begins their book with an apology. In this case, it is to author Jane Austen for using her characters. Since Death Comes to Pemberley is a sequel to Austen’s Pride and Prejudice, it is like apologizing for snow being cold. If you are going to write a sequel to a classic of world literature, it is, what it is. Don’t apologize for it. It really puts me off my reading game from the get go. Okay, I got that off my chest, so now on to more pleasant topics – the fact that the venerable mystery writer P. D. James has taken up her pen inspired by my, and her, favorite author and whipped up a murder mystery for me do devour is delightful. What Janeite in their right mind is not salivating at the thought of an Austen sequel written by such an acclaimed and exalted author? Just the thought of Austen and mystery in one sentence pushes me into the giddy zone. To say that my “wishes and hopes might be fixed” in anticipation is an understatement. It is six years since the happy day on which Mrs. Bennet got rid of her two most deserving daughters in marriage: Jane to Charles Bingley and Elizabeth to Fitzwilliam Darcy. Both sisters and their husbands are at Pemberley, the palatial country estate of the Darcys in Derbyshire, whose grandeur is only equal to the ten thousand a year that it generates for its previously haughty master and decidedly opinionated mistress. Elizabeth has settled in as chatelaine to a large estate and mother to two young sons. Life is orderly and good at Pemberley, as long as one stays out of the haunted woodland. 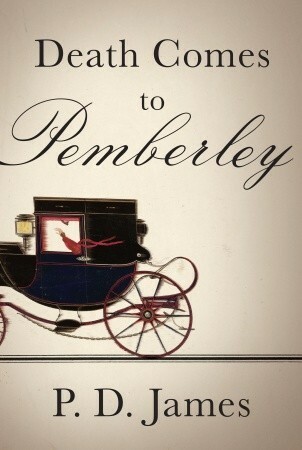 The Wickhams had been traveling to Pemberley with friend Captain Denny by carriage. Even though Mr. Wickham would never be admitted to Pemberley because of his past indiscretion with Georgiana, Lydia, uninvited, had still planned to crash the party. Wickham and Denny had quarreled while traveling through the woodland, departed from the carriage, and gun shots heard soon after. Off into the haunted woods go the search party of Darcy, Alveston and Col. Fitzwilliam to discover a body in the woodland that Lydia is certain is her husband. A murder in the haunted woodland. The investigation begins. The body is removed to Pemberley. Mr. Darcy notifies the local magistrate, Sir Selwyn Hardcastle, who arrives to conduct the inquiries. Darcy, Elizabeth, Jane and Bingley are all distraught by the shocking death. The staff is terrified that the curse of the Darcys continues in the haunted woodland. Lydia is hysterical. Lady Anne’s ball is canceled. The official inquest begins. Why did Colonel Fitzwilliam leave Pemberley to ride in terrible weather so late at night? What is the secret behind the Bidwell family who lives in the woodland cottage where Darcy’s great-grandfather committed suicide? Who, or what, is the shrouded figure who haunts the woodland? What is the motive for murder? We are happily reunited with many of the characters from the beloved original novel and deposited at Pemberley, quite possibly the pinnacle of the Janeite world. Real comfort food for Austen fans. The first twenty page of the prologue recap the plot and details in Pride and Prejudice. Was this for the benefit of her mystery readers who have not read P&P? If so, the same effect could have been achieved by working it into the narrative in a more creative way. James continues building the mystery slowly by adding in elements of the haunted woodland, the curse, and the ghostly figures reminiscent of a Grimm’s fairytale. The plot ponders along with occasional bits of excitement from that evergreen drama queen, Lydia Wickham, nee Bennet, whose character she hits spot on. Another character who she develops interestingly is Colonel Fitzwilliam. He was the second son of an earl in Pride and Prejudice, and we all know that second sons must make their own way in the world. He chose the army. His life changes drastically, and his personality, when his brother dies and he becomes heir to a grand estate. He courts Georgiana, but don’t look for much romance in this novel. It is a mystery and her romantic triangle is second fiddle to the murder investigation. Darcy and Elizabeth are, well, an old married couple and not as interesting as the proud and prejudiced characters that Jane Austen presented. I missed their witty banter. For Austen fans this will be an enjoyable, is somewhat ponderous, read if you overlook some of the annoying errors in continuity, and for mystery enthusiasts, James does spin a clever tale with a surprise ending that comes out of nowhere. Combined, the Austen and mystery elements do not play out to their potential. None-the-less, it is still an interesting read that has wrangled its way up the bestseller lists. That is an incredible achievement and great proof that the Austen brand continues to grow. I love Pride and Prejudice and I like P.D. James in her own element, and what doesn’t work about this novel is the blending of the two. It is only fair to say that I seldom come across a situation where a second author tries to expand on the canon of a former one with success. I would pretty much ascribe to the theory that when the original author leaves his characters, their story is done, unless he decides to pick them up again. Meanwhile we are all at liberty to imagine their further adventur I love Pride and Prejudice and I like P.D. James in her own element, and what doesn’t work about this novel is the blending of the two. It is only fair to say that I seldom come across a situation where a second author tries to expand on the canon of a former one with success. I would pretty much ascribe to the theory that when the original author leaves his characters, their story is done, unless he decides to pick them up again. Meanwhile we are all at liberty to imagine their further adventures if we wish. A close friend of mine loved this novel and felt it completed Pride and Prejudice. I was skeptical, after all Pride and Prejudice is complete and wonderful and almost sacred for me. But, I need a book whose title was a complete sentence for a challenge that needs finishing, and this one fit the bill. I should always trust my better instincts. I could have better appreciated this novel if I could have imagined these as new characters, involved in their own story. In fact, I did not find that these characters acted or spoke in the way I myself would have envisioned the Darcys and company at all. The mystery was a little thin and the denouement a bit boring. This simply isn’t P.D. James at her best and it was unnecessary because she has the ability to invent her own characters and worlds, as she has proved in her other fiction. This is my third disappointing read in a row. Not something that generally happens to me. It makes me very tempted to pick up a book I have already read, and know that I love, just to remind myself that there is magic out there waiting somewhere. I was encouraged by the entertaining prologue. A recap of the P&P plot was only to be expected, and it was amusing to hear it from the point of view of Meryton society gossips, who suspect Elizabeth was maneuvering to catch Mr. Darcy from the first time she laid eyes on him. I thought the author was getting all of the rehashing out of the way so that she could tell her new story. Unfortunately, that’s not the case. Throughout the novel, the characters remind themselves and each other of event I was encouraged by the entertaining prologue. A recap of the P&P plot was only to be expected, and it was amusing to hear it from the point of view of Meryton society gossips, who suspect Elizabeth was maneuvering to catch Mr. Darcy from the first time she laid eyes on him. I thought the author was getting all of the rehashing out of the way so that she could tell her new story. Unfortunately, that’s not the case. Throughout the novel, the characters remind themselves and each other of events that happened in the original novel. Six years have passed, but the book ends with Darcy apologizing to Elizabeth all over again for separating Bingley and Jane, and for his awful proposal! The author also repeatedly inserts recognizable phrases - Elizabeth has “fine eyes” and people worry about the shades of Pemberly being polluted. Other than the repetition and rehashing, the writing isn’t bad. But the characters are lifeless, and there is strangely little interaction between Elizabeth and Darcy. The dialog largely consists of monologues. There’s a murder mystery, but nobody tries to solve it; it’s resolved by a series of confessions at the end. P. D. James, byname of Phyllis Dorothy James White, Baroness James of Holland Park, (born August 3, 1920, Oxford, Oxfordshire, England—died November 27, 2014, Oxford), British mystery novelist best known for her fictional detective Adam Dalgliesh of Scotland Yard. The daughter of a middle-grade civil servant, James grew up in the university town of Cambridge. Her formal education, however, ended at P. D. James, byname of Phyllis Dorothy James White, Baroness James of Holland Park, (born August 3, 1920, Oxford, Oxfordshire, England—died November 27, 2014, Oxford), British mystery novelist best known for her fictional detective Adam Dalgliesh of Scotland Yard. The daughter of a middle-grade civil servant, James grew up in the university town of Cambridge. Her formal education, however, ended at age 16 because of lack of funds, and she was thereafter self-educated. In 1941 she married Ernest C.B. White, a medical student and future physician, who returned home from wartime service mentally deranged and spent much of the rest of his life in psychiatric hospitals. To support her family (which included two children), she took work in hospital administration and, after her husband’s death in 1964, became a civil servant in the criminal section of the Department of Home Affairs. Her first mystery novel, Cover Her Face (1962), introduced Dalgliesh and was followed by six more mysteries before she retired from government service in 1979 to devote full time to writing. Dalgliesh, James’s master detective who rises from chief inspector in the first novel to chief superintendent and then to commander, is a serious, introspective person, moralistic yet realistic. The novels in which he appears are peopled by fully rounded characters, who are civilized, genteel, and motivated. The public resonance created by James’s singular characterization and deployment of classic mystery devices led to most of the novels featuring Dalgliesh being filmed for television. James, who earned the sobriquet “Queen of Crime,” penned 14 Dalgliesh novels, with the last, The Private Patient, appearing in 2008.